Bowe & Johnson partnership to reunite at B12hr? ONE OF the most famous partnerships in Bathurst history could be reunited at the 2020 Liqui-Moly Bathurst 12 Hour. Loose plans currently exist to reunite the famous Johnson and Bowe surnames at Bathurst via an entry in Australia’s International Enduro, revealed by two-time 12-Hour winner Bowe in a chat with Greg Rust’s podcast, Rusty’s Garage. Listen to the full podcast by clicking here. 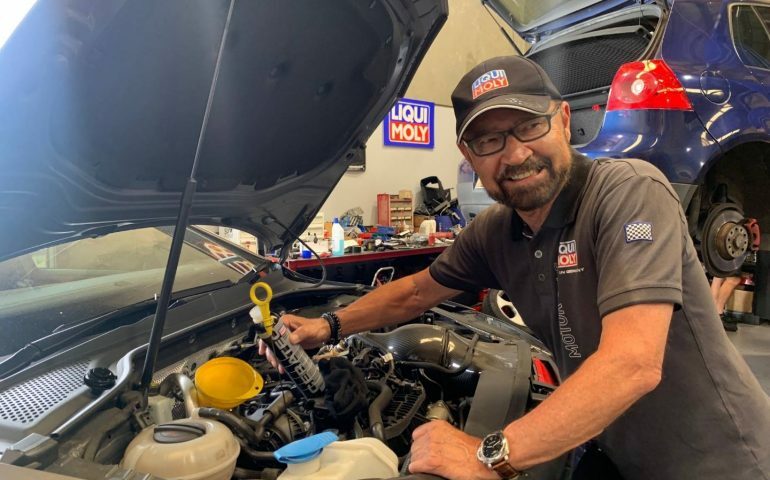 Bowe, a brand ambassador for 12-Hour sponsor Liqui-Moly, told Rust that discussions have taken place to potentially field an entry in the race next year, with Steven Johnson and DJR Team Penske enduro driver Tony D’Alberto part of the plans. “This year I decided I wouldn’t do the 12-Hour, first of all because I had a lot of stuff to put together for my Touring Car Masters campaign, so I didn’t have time to train much,” Bowe explained in the latest episode of the podcast, conveniently released on his Birthday. “I drove up there to be there as an ambassador of Liqui-Moly who sponsor the race, and I got there and I go ‘gee, I wish I was driving!’.. Then half way through the race when I saw all these young, fit athletes collapsing in the pit lane I thought ‘gee I’m glad I’m not doing this!” he joked. Bowe explained that a sponsor well-known to all three parties was involved in the early discussions, with all parties apparently keen to make it happen. “It may well happen. I said I’d like someone like Steve in it who’s got a lot of ability and ‘Tony D’ is a very good little driver. So I can do the easy stuff in the middle of the day when no one looks too much and they can do all the hard work. “It might happen – if it’s going to happen it needs to happen by November so I can make myself ready for it and do some mileage. “Those cars are quite.. because they’ve got such high levels of grip they’re quite taxing so you need to be ready for it. “I’d like to do it as a swansong,” Bowe added. “But as a fun event. Since it became a Pro-Pro event it’s changed to a very ‘cutthroat’ thing. I’d like to do it with those guys just for fun. Bowe is a two-time Bathurst 12 Hour winner, once in a Production Car BMW and the other in a Ferrari 458 GT3 in 2014. Johnson is a class winner in the race driving a Porsche GT3, while D’Alberto finished on the podium at Bathurst with Shell V-Power Racing two years ago in the Supercheap Auto Bathurst 1000.